Polish or Deflate the Elephant? You are here: Home / Facilitation / Polish or Deflate the Elephant? In this week’s article we include a description of a challenge sent in by one of our readers along with my response. While this particular issue is around conflict in the workplace, the framing of question speaks to the opportunity we have as facilitators to invite groups to refine any unhealthy or unproductive process that they engage in regularly. I am facilitating a great number of teams in my organization and what I am finding lately is that people are very harsh and come across very aggressive with me and with their managers. I facilitated a session last week, where the manager came under attack when he responded to an incorrect and unfair statement by one of the participants. I tried to get people to articulate themselves in a more neutral manner and moved to the next topic when we started drifting off topics. I suggested to park that topic and address it at another meeting. It seems like conflict is rampant and lingering all over the place lately. When is a good time to address it when we are scrambling in completing projects? Addressing conflict will certainly slow things down. However, it needs to be dealt with because it is already slowing things down. I recently facilitated a session for facilitators and they also said that they are experiencing similar situations in our organization. I feel like Alternative Dispute Resolution would be a great asset for me to have as a facilitator. In the next few weeks I will need to facilitate a group of nurse practitioners who work with palliative patients where two of them are literally at each other’s throat and their conflict is based on personal values. Any suggestions? I appreciate you painting this picture from the inside of your organization and I know that you’re not alone with this kind of scenario. Stress and frustration are increasingly common in the workplace as many of us are asked to do more and more with less and less. however, it needs to be dealt with because it is already slowing things down. You highlight quite well the cost and value of facilitative interventions. When we see that our team is dysfunctional in some way, this dysfunction often permeates everything we do. It’s like driving around in a truck with a flat tire that we avoid fixing because we’re too busy to take the time. Improving group process takes time but if the intervention is effective, improvements in efficiency and the working atmosphere are well worth the investment. Conflict is a natural facet of living and working with others. An important distinction that was missed by most of us in our early upbringing and education is that conflict can be either healthy or unhealthy. 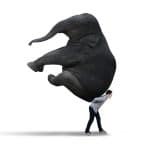 Since few of us have witnessed examples of healthy conflict, we tend to view all conflict as unhealthy and like the proverbial “elephant in the room,” avoid it at all costs. This causes us to retreat to the safety of shallow, ineffectual relationships with our colleagues. When we learn how to engage in healthy conflict and its effective resolution, we discover increased connection and trust, which equates to superior communication, cooperation, and results in our workplaces. The key is to help your people own their feelings and express their NEEDS or INTERESTS rather than pounding on POSITIONS. Positions, what we want, just keep us locked in argument while revealing interests, why we want it, or in other words what we value, help us connect and understand each other’s needs on a deeper level. The deeper we go into one another’s needs and interests, the more they begin to look the same. Yes, this does require some vulnerability, and perhaps not everyone is willing to go there at first. But if we can intervene strongly on personal attacks and continue to encourage the airing of desires and interests, perhaps those completely unrelated to work at first, we’ll be moving in the right direction. Where might “fix a flat” in your groups this week? I’d love to hear what you come up with. Share your comments with us below.